Thank you for joining us for the Something New Challenge and we hope you will join in with our new theme! We are showcasing HERO ARTS PRODUCTS this week. You don’t have to use them to join in with the challenge, but if you have them we would love to see them used! Here is my take on the Ombre challenge! I had a few ideas in my head. I decided to go with this one. Getting the ombre effect with copic markers on this design took me forever. A lot of work but that is how I work. I take the harder route to the easy one always lol! So to make this card, I used Hero Arts Tea Flowers stamp set to stamped all the images in black on white card panel. Then I used BG11 BG13, BG15 and BG34 to colour the background to get the ombre effect. Blending large area with copics is not easy especially if there are to many nooks and corners. Like I said I spent about 20 minutes get it looking good. I LOVE the effect especially with the details on the flowers and leaves. Then I used the largest and the third largest rectangle dies Simon Says Stamp Stitched Rectangle die set to emboss on the stamped and coloured panel. Embossing gives finer details on the coloured panel and also frames the die cut sentiment. 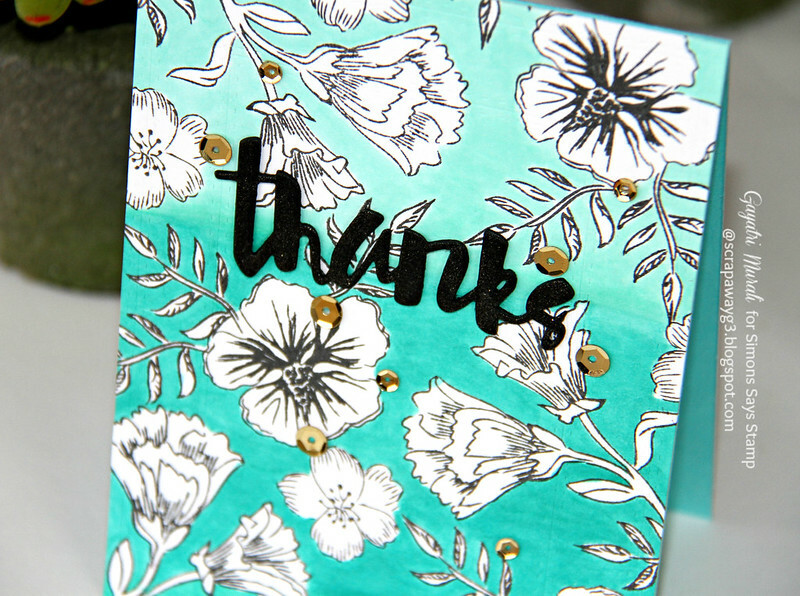 The die cut sentiment is called Painted Thanks from Simon Says Stamp. I die cut three using black cardstock, stacked and glued together. Brushed the die cut with Wink of Stella clear pen. Finally embellished with gold sequins from Pretty Pink Posh! 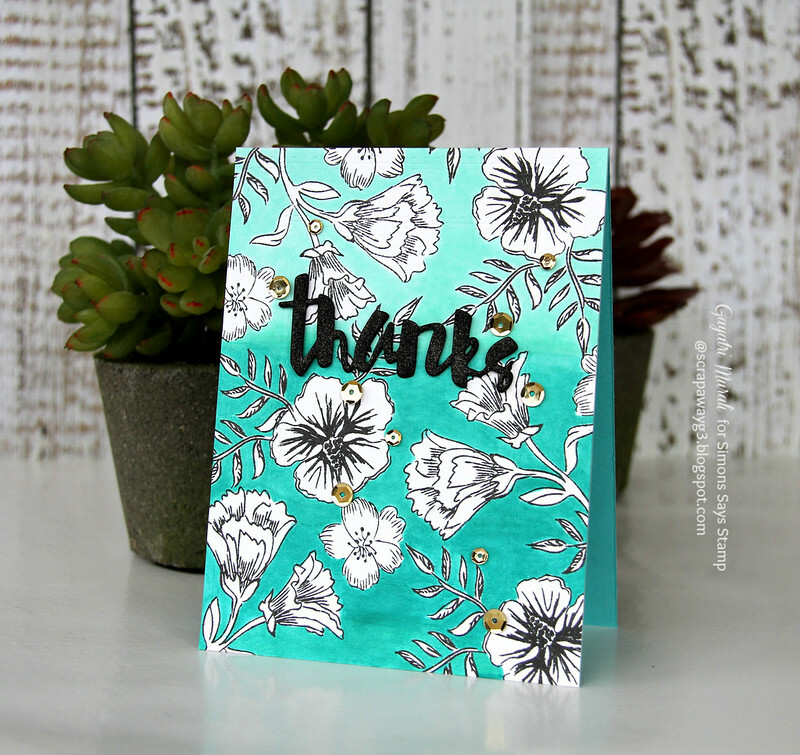 There are fabulous Give Aways and inspiration from fabulous designers on a daily basis over on the Simon Says Stamp Blog , if you haven’t subscribed by email you may want to so you don’t miss out. Beautiful, Gayatri, and well worth all the labor that went into its making! I don't think I've ever seen this HA set before; thanks for showing us! I love the black Hero Art flowers on the white and super with the colouring on the aqua ombre!! Stunning card Gayatri! Your background is so beautiful!! Oh my gorgeousness! Love this card!!! Beautiful card!! Totally worth the time you took to make it!! Gorgeous! Not coloring the flowers made your ombre background POP even more! Gorgeous Gayatri. Ombre is such fun. I say all your hard hard work was worth every single second. Your card is elegant beyond elegant. I think the shade you chose is so pretty and the sentiment simple and perfect! I love the graphic feel of your card. Blessings!